Hi and welcome to Raring2go! the definitive guide of what to do and where to go for parents, carers and children. My name is Chris and I am the Editor for the Brentwood, Billericay & Wickford area. 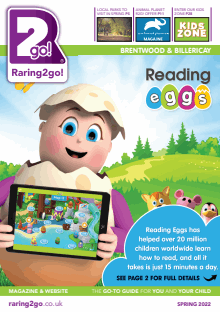 You can contact me on 07772 564 150 or email me at brentwoodandbillericay@raring2go.co.uk. In every issue of the magazine, we have all the latest news on events and things to do in the area...plus we have some great competitions and vouchers both in print and online! Don't forget to mention Raring2go! when you respond to an advertisement.